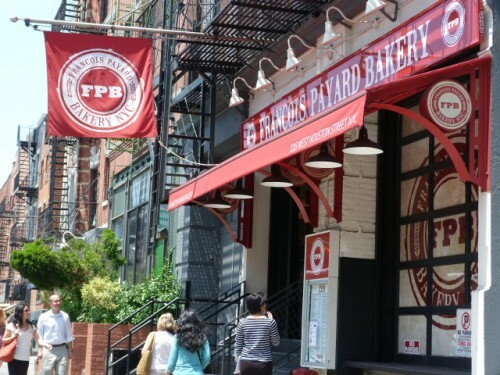 Last week news came that Battery Park City would be getting a branch of Francois Payard Bakery (among many other eateries) later in the year. I’d heard good things about the locations just outside of the Downtown Lunch border, on the east side of W. Houston (btw. Thompson & Sullivan) and decided I’d finally eat lunch there and see if all of you World Financial Center workers could start getting excited. Find out the verdict, and see what kind of desserts you can look forward to after the jump. The lunch options are the usual sandwiches (Cuban, ham & brie, vegetarian), salads (cobb, nicoise), quiche and one mean looking croque monsieur that was absolutely covered in browned cheese. Since it’s a French bakery, there is also a roster of croissants and other baked goods, on top of the fancy-looking tarts and pastries staring you in the face as you order your lunch. 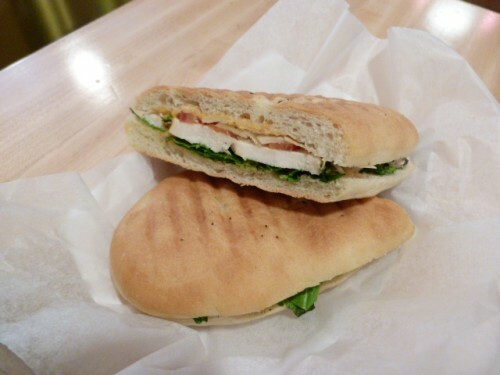 I went with the roasted chicken & arugula sandwich ($8.50) that had tomato, parmesan and some sauce on it. It was tasty, and a decent size although some of you heartier eaters may wish it were bigger for the price. 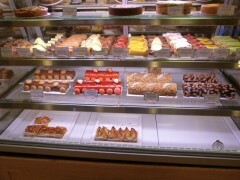 As much as that croque monsieur with its two cheeses and bechamel called to me I had to save some stomach space for …. 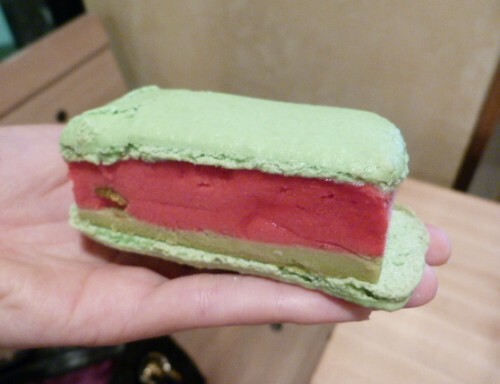 ….a macaron ice cream sandwich ($4)! There are four kinds, three of which use macarons as the outer part (the other uses brownie). I went with pistachio filled with raspberry sorbet and pistachio ice cream and it was as pretty to look at as it was delightful to eat. Normally I find macarons too sweet but here the shell was balanced out by the tartness of the raspberry. My verdict is if you like French bakeries and nicely-made sandwiches, and are willing to spend a bit more for lunch than eating at a street meat cart, you’ll likely be a fan of Francois Payard’s creations. If not, you can at least use it for the occasional ice cream sandwich fix. It’s Francois Payard and he makes a damn fine croissant. It’s a nice place to eat lunch if I don’t want table service. Meh, it’s kind of expensive. I’m not walking to the other side of Houston for a sandwich and salad. 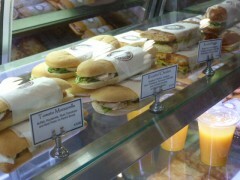 Posted by Andrea H at 11:45 am, June 16th, 2011 under Francois Payard Bakery, Sandwiches, South Village, Sweets. I love their chocolate almond croissant. In fact any of their croissants are pretty great. They have sandwiches with pretzel rolls, which are totally intriguing and now that will be around us for lunch, gonna be MINE. Thought about getting the sandwich (only 1) that’s on a pretzel roll but it didn’t look as awesome as I’d hoped.